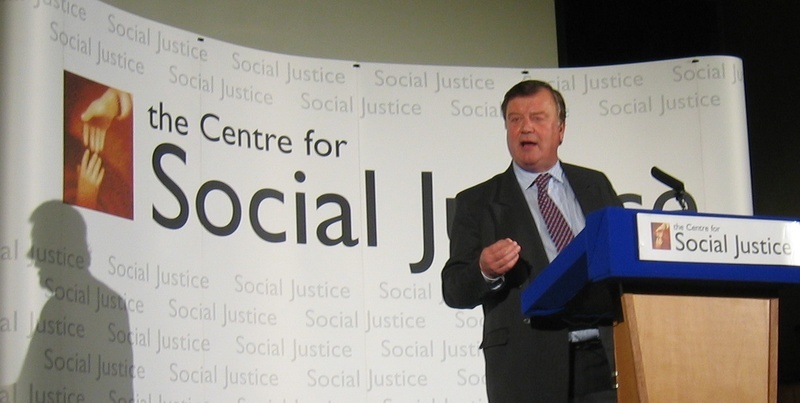 I attended this speech yesterday and was impressed by both the speaker, the issues he raised and also the work of the Centre for Social Justice. I am pleased that this group has hosted or will host many of the big name candidates. Ken Clarke also touched upon incentives to encourage people to save for the future both with pensions and other savings, a topic I feel strongly about as a twenty something who is having to consider private pension provision for later life already. This stuff is pretty popular at the moment among voters. Starting to think Ken might be the only way to get some life back into this party. I wish I'd heard that speech.Like the above I'v been pretty impressed by what I've heard from Ken so far. Ive not settled on on a candidate for sure yet and Ive not said here who I might be interested in for sure, but Ken Clarke is making sense to me. The only difference Ive had with him is over Europe, but thats not an issue at the moment. I think he was absolutely right about point 1 with the rejection of subsidizing private sector services, a la "Patient Passports"
Ill make my decision by the time the final vote is organised but I am leaning towards Clarke here. James, Europe is an issue and will be over the next few years. Key elements of the constitution are being implemented through a series of directives. The rest will follow in more treaties that will not be put to referenda, especially if Ken connives with Blair and Kennedy. I think Selsdon,that a Conservative shadow cabinet would not let that happen.Ken has already said that he would abandon Blairs 'presidential' style of governing.If he means what he says it is likely that any shadow cabinet would be overwhelmingly eurosceptic. Malcolm, I cannot believe that Ken would appoint an overwhelmingly eurosceptic shadow cabinet. He will find places for those who are of his persuasion. Selsdon is absolutely right here, the party would be split the first time an EU controversy arose. James,Surely the patient's passport was a distinctively conservative policy, rewarding those who are prepared to help themselves; the savers. By rejecting the "right to choose" agenda, Ken seems to be leaving everyone to the mercy of the state. Where is the clear blue water to make our party distinctive from Labour? "I think he was absolutely right about point 1 with the rejection of subsidizing private sector services, a la "Patient Passports"
But they would enable more people to access private services, especially those who currently cannot afford them. It was distinctive but it was both confusing to the electorate and stunk of giving taxpayers money to private services. It gave ammo to the Labour Party since they could claim that the Conservatives couldnt care less about the NHS. Interesting point about increasing access...but then it only provides access to those who can afford it. Those unable to afford private healthcare will have to wait for their operation. Private healthcare providers could siphon off the best workers. It would create a two tier health service. The point was that a lot more people can afford the cost of half an operation, than can afford full private cover. It would also reduce the load on the NHS, by taking people off waiting lists. Moreover those people would cost the NHS half the amount they would cost if they stayed in line. It should have been a win-win policy. "there should be a decentralised service delivered by more responsible local leadership. Responsibility should pass downwards to NHS Trusts, Primary Care professionals, Grant-Maintained Schools (now re-named Foundation Schools) and City Technology Colleges (now renamed City Academies). National standards should be set down and inspected so that local management can be accountable both upwards to the Secretary of State and locally to the communities they serve." "This culture of centralism has done critical damage. It has stifled local initiative. It has all but eliminated managerial creativity. Teachers, doctors and other public sector professionals have been overwhelmed with initiatives, directives, circulars and targets destroying morale. All this upheaval has created a sense of permanent revolution. There is a feeling in the public services that careers depend on the obeying of central directives and there is a risk-averse fear of bad publicity. There is constant pressure from the centre to deliver what the professions know is impossible to deliver quickly faced with the reality of local pressures." "Fourth, let reform work in a genuinely localised way. Power must be devolved downwards but there must be accountability upwards. The centre needs to be small but effective. The vast range of units, advisers, and quangos created by Labour will have to be removed. We should reduce the size of central Government Departments dramatically. The Treasury and No 10 must be taken out of detailed involvement with delivery entirely. The number of targets and central directions must be cut to a handful of sensible priorities. But budgets should be in local hands in a way that will allow money to meet local demands and capital investment to finance the new capacity to meet local patient and parent-led demand. What you must do at the centre is to provide some measure of control to prevent sudden shocks and to smooth out swings in demand and resources." "Secondly, I believe that local managers should have the freedom to innovate. Too many managers now devote their imaginative skills to finding ways round Government targets. I do not want hospital managers to be coming up with clever wheezes like keeping patients in ambulances at the hospital gate in order to meet their admission time targets in A and E. I want those same managers to be devising new approaches that will actually reduce the waiting times for patients."